Couples feel like there is something wrong with them. They don’t want to admit something is wrong or admit they’re too weak to handle it. Never pushed my story, but found opportunities to tell my story when it was appropriate. During my volunteer work within Oncology at Children’s Hospital Colorado, I never personally had a child who was battling cancer, but I did understand the feeling of loss. In this case, I didn’t tell my story all of the time, but when I did there was an immediate connection. When people asked, I never lied. We were so excited when we found out about our first pregnancy that we announced our pregnancy to the world and when it didn’t happen, we were in the position to discuss what happened. Yes, some people had a hard time learning our truth, but also felt being honest about our miscarriage was freeing and took the 100 lb. elephant off the table. I told my story when I knew it would help people. Amazingly, when you go through a miscarriage – it seems the doors open and you suddenly learn of all of the people who also have gone through a miscarriage. When I have been asked my life story in interviews and introductions, I almost always mention both my miscarriages and the adoption of our daughter. I believe both stories have had a big impact on my life and are part of who I am in every sense – my faith, my relationships, what’s important in life, etc. Lastly, writing my story is cathartic and healing on its own. The process of actually putting words to paper is a gift to yourself and hopefully others who read your story in blogs, magazines. or news articles. Sure, telling your story is difficult, but it gets easier every time you tell it. Also, you can determine how detailed you get in your story with who you are talking to. For me, it is hard to talk through the pain, but never difficult to mention my story. From day one, I tried not to solely focus on the bad statistics, but to focus on the statistics that focus on hope such as for most couples who miscarry, they have the same chance of having a successful pregnancy as anyone else if they try again. Also, I allowed myself to have closure through a funeral service, burying special items, and letting go of a balloon every year in remembrance. Having these ceremonies still allows us to interweave our children into our lives, so, they do not seem lost or gone. Again, I know it’s not easy, but your story may be life-changing for someone. When I attended a book writing conference, four of the five publishers and publicists I spoke to in one day got teary eyed and said my story was their story. They told me it was the hardest time of their lives, so, if a book was written about the topic of miscarriages – the pain could never be erased, but maybe it could be eased. Maybe someone who is struggling with their faith would not give up. Maybe a marriage could be saved. 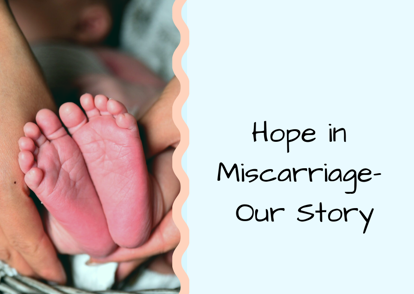 My first miscarriage occurred a year after I was married and after 7 months of being pregnant. We were so excited! I still remember running into the bedroom with the pee stick and yelling…it is positive!! During the pregnancy, we had a trip planned to Disney World and my husband bought a toy everywhere we visited to give to the new baby. When we returned from the trip – we had a message from the doctor’s office saying the results of the voluntary tests we had taken at 6 mos. had come back and the tests were concerning. They told us to come in for a high-powered ultrasound and an amniocentesis. At the appointment, the nurse left the room crying. When the doctor came into the room, he looked at the ultrasound and said nothing was developing or functioning correctly. He said, at this point, the pregnancy was dangerous to us and there was no chance the child would have quality of life. We went home and prayed a lot. We cried a lot. We talked to our church small group. However, in the end, we made the choice to be voluntarily induced. On a good note, for a story which is so bad, we found out at the hospital that our child was a little girl and she had already passed naturally. I believe God gave us this closure. However, for my husband, it took years for him to enter a church again. He was devastated and he said God knew how much he wanted a child, so, to take this away from him felt cruel. The problem was we never thought we could become pregnant. My husband had a sports injury and my sister went through infertility, so, when we did become pregnant – we wondered why would the child be taken away from us? It was heart crumbling. Now we’re both back into our faith, but it took time and a lot of head, heart, and soul healing. The next miscarriage occurred about 6 months later while on a trip to Mexico. This time, we were early into the pregnancy. We were somewhere between 8-10 weeks pregnant. Before going, we had our first doctor’s appointment and at the appointment the physician could see the amniotic sack, but could not detect a heartbeat. She said this could be for two reasons. Either it was still too early to detect the heartbeat or I would miscarry again. We left the next day on our trip (since the Dr. said there was nothing we could do), but while taking a nap on the third day of our trip, I woke up in a puddle of blood. I immediately went into the bath tub because I believe my body was in shock and I was shaking and cold. My husband called the resort’s physician who said sure enough I had miscarried and he gave me medicine to help naturally get rid of the tissue. He said I should visit my primary doctor when we returned to the States. We had gone on this vacation with friends, so awkwardly all of our friends left and went to dinner as we dealt with the immediate grief of losing another child. We wondered if we’d ever be parents or if this was our destiny. 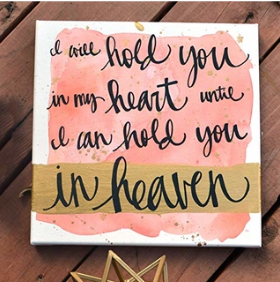 Unfortunately, while on this Earth, we’ll never know the gender of our second child since we were not in a hospital and since we didn’t have any tissue sampling, but I know in heaven there are two children waiting for me. Eventually, our story ended with a beautiful little girl named Ryley who we adopted. Although, we wish we could have all of our children under one roof, this is not our story. We still grieve the loss of Hope and our unnamed child, but feel blessed for Ryley and look forward to meeting our other children someday. We know miscarriage stories end in very different ways, so, your story might not end like our story, but we’d love to hear your story. If you’re brave enough, want to help ease the pain of others, want to share your faith journey, and don’t want to be a statistic, the Watts Bugging You Family is here for you in love, heart connection, and support! God Bless and Namaste!